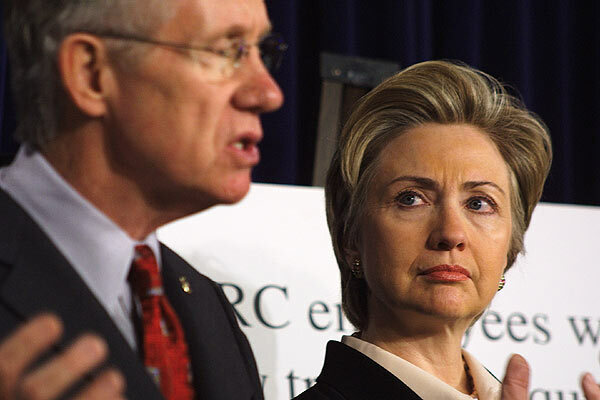 January 9, 2003 - Senator Hillary Clinton (D-NY) (right) listens to Senate Assistant Minority Whip, Senator Harry Reid (D-NV) talk about the need to secure our nation's nuclear power plants. Senator Reid stated, ""Last year the President warned us of vulnerabilities at nuclear facilities, and now, a year later, the Nuclear Regulatory Commission has done nothing to improve the safety and security of our nation's nuclear power plants. In fact, the NRC has been so negligent that one-third of its employees question the agency's dedication to safety. Something must be done."